In the off-host backup mode, backup processing is shifted from the source Microsoft Hyper-V host to a dedicated machine — an off-host backup proxy. The off-host backup proxy acts as a “data mover”. The Veeam Data Mover running on the off-host backup proxy retrieves VM data from the source volume, processes it and transfers data to the destination. This type of backup does not impose load on the source host. As resource intensive data processing operations are performed on the off-host backup proxy, production hosts remain unaffected. 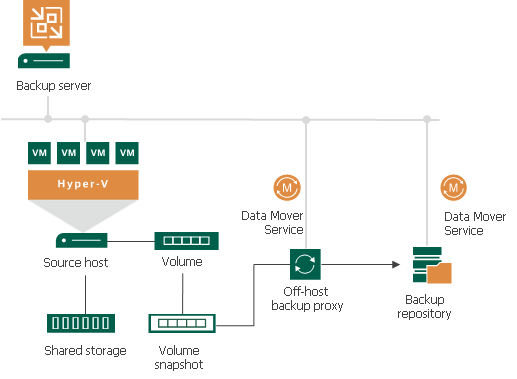 To perform off-host backup, Veeam Backup & Replication uses transportable shadow copies. The transportable shadow copy technology lets the backup application create a snapshot of a data volume on which VM disks are located, and import, or mount, this snapshot onto another server in the same subsystem (SAN) for backup and other purposes. The transport process is accomplished in a few minutes, regardless of the amount of the data. The process is performed at the SAN storage layer so it does not impact host CPU usage or network performance. For more information about transportable shadow copies, see http://technet.microsoft.com/en-us/library/ee923636(v=ws.10).aspx. Veeam Backup & Replication triggers a snapshot of the necessary volume on the Microsoft Hyper-V host. The created snapshot is detached from the host and mounted to the off-host backup proxy. The Veeam Data Mover running on the off-host backup proxy uses the mounted volume snapshot as a data source. It retrieves VM data from the volume snapshot, processes it and transports data to the destination. After the backup process is complete, the snapshot is dismounted from the off-host backup proxy and deleted on the storage system. If you plan to perform off-host backup for a Microsoft Hyper-V cluster with CSV, make sure you deploy an off-host backup proxy on a host that is NOT a part of a Hyper-V cluster. When a volume snapshot is created, this snapshot has the same LUN signature as the original volume. Microsoft Cluster Services do not support LUNs with duplicate signatures and partition layout. For this reason, volume snapshots must be transported to an off-host backup proxy outside the cluster. If the off-host backup proxy is deployed on a node of a Microsoft Hyper-V cluster, a duplicate LUN signature will be generated, and the cluster will fail during backup or replication. List of tested VSS hardware providers for DPM: https://technet.microsoft.com/en-us/library/hh758219(v=sc.12).aspx. DELL PowerVault: http://www.dell.com/downloads/global/products/pvaul/en/hyperv_data_protection_guide_on_%20dell_powervault_md_series.pdf. The VSS hardware provider for Dell PowerVault can be found on the Resource CD. Dell EMC (Clarion and Symmetrix): https://support.emc.com/downloads/. To get detailed information, contact your storage vendor.